Welcome to the first edition of Glamour & Grammar, the new series in which I'll address grammar fails grammatical failures in pop culture. Today we'll be talking about Lady Gaga and her flagrant misuse of pronouns. 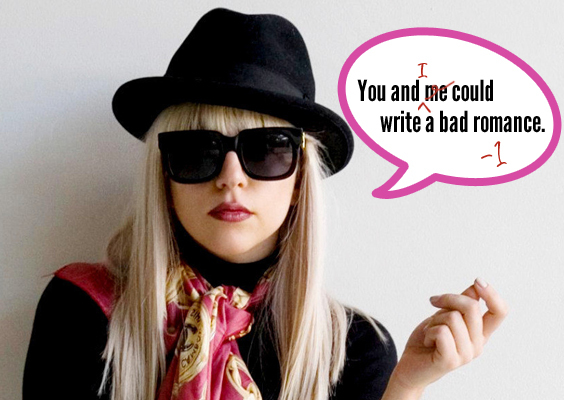 In Gaga's newest hit, "You and I," the singer mistakenly follows "about," a preposition, with "I," a subjective pronoun, instead of "me," an objective pronoun. Using the word "I" when the word "me" is correct is the grammatical equivalent of sticking your pinky out while drinking beer. It's out of place, and it has the potential to look pretentious. This grammatical mistake pains me more than all others because it's an overcompensation. People don't say "and I" unthinkingly. They say "and I" deliberately because they've been taught that "and me" is wrong. Sometimes "and me" is wrong. Take, for example, Lady Gaga's 2009 hit "Bad Romance." In it she uses "me," an objective pronoun, as a subject. In an attempt to avoid this ostensibly more grievous mistake, many people have begun to avoid "and me" and "or me" altogether. These constructions overestimate the capabilities of "I" and underestimate the capabilities of "me." Just because "me" makes an unfit subject or predicate nominative doesn't mean it can't make an apt direct object, indirect object or object of a preposition. And just because "I" makes a first-rate subject or predicate nominative doesn't mean it can function as a direct object, indirect object, object of a preposition or possessive adjective. Read: "I's" is never a word. So next time you're trying to pick between "me" and "I," ask yourself, "WWLGD?" And then do the opposite. Just kidding. But, seriously, I hope this blog undoes a bit of the damage done by Gaga's grammar and makes the future of pronouns a little bit brighter for you and me. p.s. Yes, I am aware of the fact that "you and me" doesn't rhyme with "cool Nebraska guy," but I'd be willing to bet she came up with the "you and I" line before the "Nebraska guy" line. p.p.s. What types of grammatical errors pain you most?